To keep your engine in top shape you need to do more than simply change your vehicle's oil. In fact, getting your oil filter changed can make a huge difference. 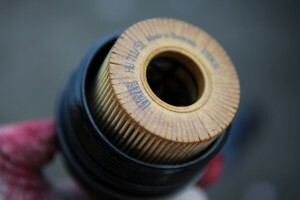 The problem, however, is that many people don't know very much about their oil filter. To help you understand why getting this part changed is so important, read this post. Your vehicle relies on motor oil to help it run safely and smoothly, so much so that it is often considered your vehicles' main bloodline. It should then come as no surprise that your vehicle's oil will have to be at its best in order to keep your engine protected. This is because as your oil travels through your engine it performs a number of jobs. It does everything from lubricating the tiny moving parts in your engine to keeping your motor clean and free of deposits. Over time, your oil will become dirty, which is normal and also the reason you have to get oil changes. However, another important factor in all of this is your vehicle's oil filter. As your oil flows, it also passes through your oil filter. This part does exactly what its name states: it filters your oil. This is necessary because as your oil gets older it will become more and more saturated with debris and other contaminants. This can be anything from dirt to tiny metal parts that come off of your engine. As your oil get dirtier, it may not only lose some of its important qualities, it can also contribute to buildup and deposits on your motor. These can lead to added strain and reduced power. Your oil filter sifts your vehicle's oil and traps these contaminants. This helps keep your motor oil cleaner for longer and ensures your engine stays well protected. However, after some time, your oil filter can get full and will no longer be able to trap new contaminants. This is when your filter will need to be changed. Keep your engine working smoothly with the help of a synthetic oil change in Chambersburg, PA. While you're at it, don't forget to also replace your old oil filter with a new one. For help finding the quality products you need, contact Cerberus Systems, Inc. at (717) 658-1256. They can help you find anything from oil filters to quality AMSOIL synthetic oils for all of your engines. There are different suggestions when it comes to how often you should get your oil filter changed. One of the most common suggestions is to change it with every oil change, and this makes sense. When you change your oil you're replacing old, dirty oil with a batch of new oil. An old filter that may already be filling up can contaminate your new oil faster and may lose its ability to retain particles quicker. This means your oil will get dirty faster, forcing you to get an oil change sooner than you anticipated. If you perform you oil changes at home, you can also change the oil filter yourself. To figure out where it's located, consult your owner's manual. Depending on the make and model of your car, it may only be accessible through the top of your car or from underneath. While you're checking your owner's manual, be sure to look for additional specifications. This is important because oil filters come in a number of sizes and range in quality. You will need to use the correct size in order to avoid oil leaks and other issues. When looking for a good oil filter consider its particle size retention and its dirt holding capacity. These refer to the filter's ability to trap particles of different sizes and the amount of debris it can hold before it needs to be changed. Oil filters tend to be quite inexpensive, so you don't have to worry about breaking the bank while looking for a quality oil filter that will keep your oil cleaner for longer. While getting your next synthetic oil change, don't forget to also get your oil filter replaced. If you want to do this yourself, get in touch with Cerberus Systems, Inc. at (717) 658-1256 for help finding the perfect AMSOIL Oil products. You can find their full range of products in their online shop.